– You’ll be redirected to the PlayStore. From here you can look for an app, for example Outlook, and click on Approve. – You can approve as many apps as you want: they will all be authorized company-wide (but you’ll be able to restrict some of them depending on policies later on). Once you go back to your admin console, you’ll be able to see a list of all your Enterprise approved apps. Note: Once you’ve approved some apps (public, web or even private ones) you’ll be able to customise your Play Store by creating App Collection. Simply click on Customize Play Store, then on Create a collection, and reorder your apps as you please. >> WHAT ABOUT WORK PROFILE? 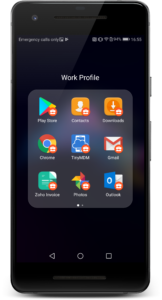 In a Work Profile setup, the end user will have access to a secure folder on his device, containing all the approved business apps and data (they have a particular business icon setting them apart from personal apps). A business Play Store will be accessible in this folder, with only Enterprise approved apps visible.